The YHM NITRO® 30 comes with interchangeable rear caps and muzzle caps (muzzle break option shown). The YHM NITRO® 30 Stainless Suppressor raises the bar of modularity for modern suppressors. Typically in the past a suppressor was specifically designed for a particular caliber. There might be a slight variance that would allow a small range of similar calibers to be fired through a single suppressor, but that was about as far as things went. Obtaining a Federal Tax Stamp to own a suppressor is both laborious and time-consuming. Being limited to a small range of calibers or attachment options, can make suppressor use that much more frustrating. With the YHM NITRO® 30 Stainless Suppressor the shooter is provided sound suppression over a very large range of rifle calibers. Everything from .17HMR to .300 Ultra Mag can be suppressed with the NITRO 30. Now a shooter can purchase one can to cover multiple rifles effectively. The YHM NITRO 30 may not be the first can to accomplish this feat, but it is sure a welcome addition to the suppressor community. YHM rates the noise reduction capability of the NITRO 30 at 135 dB. A typical firearm shot is going to range from 140-175 dB. Many organizations (OSHA, ASHA, etc.) recognize 140 dB as the threshold of permanent hearing loss at even very short exposures. OSHA recognizes exposure to 85 dB (idling heavy machinery) over an 8-hour day can cause permanent hearing damage. What is more important, is that after 85 dB the exposure time to prevent hearing damage is cut in half for every 3 dB. So constant 88 dB noise, only allows 4 hours of exposure before damage, and so on. So despite the NITRO 30 135 dB rating, the level of protection from 140 dB (immediate permanent damage) is actually quite significant. The (2) NITRO 30 rear caps – QD on left, and threaded on right. YHM has been attentive to end-user feedback and demands. The NITRO 30 Stainless Suppressor provides the shooter modularity in mounting and use by including two rear caps and two muzzle caps. The rear caps offer a direct thread attachment option, or a very fast QD attachment option. This is particularly nice for those who will be transferring the NITRO 30 to multiple rifles; as well as, for those who may need to shorten overall rifle length to move through tight spaces or remain more incognito. Obviously the threaded rear cap is better for a dedicated rifle set up. The NITRO 30 comes standard with .30 caliber caps, but optional 5.56mm caps are also available. The muzzle caps include a flat option and a muzzle brake option. The flat muzzle cap provides a more traditional suppressor end appearance, and reduces overall shot signature as well. This cap is particularly beneficial to tactical users in the military or law enforcement, where keeping your location hidden is vital to survival. The muzzle brake cap provides additional muzzle rise reduction through a final expulsion of gases through ported holes in the cap. 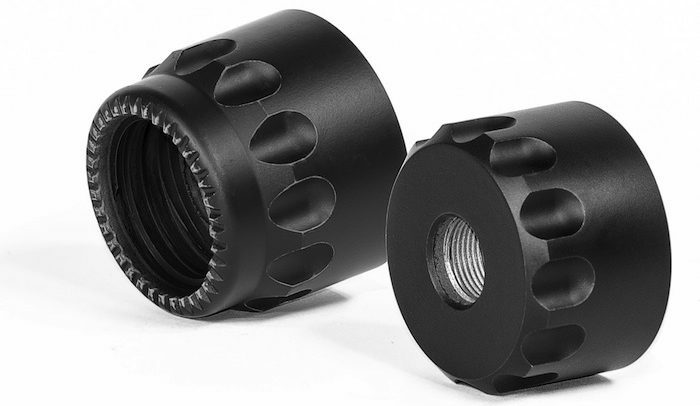 YHM sees the muzzle brake cap more beneficial to target shooters, or perhaps hunters. YHM includes (2) muzzle caps with the NITRO 30 – Flat on left, Muzzle Brake on right. When thinking of design enhancement features YHM determined they could make the NITRO 30 more user-friendly and simplified by removing some of the retention components from the can itself, and placing them on the included muzzle brake instead. By simplifying the suppressor, YHM can help reduce overall price and complexity. The NITRO 30 Stainless Suppressor is backed with YHM’s lifetime warranty. The YHM NITRO® 30 Stainless Suppressor is made completely with 17-4 PH stainless steel. This steel is particularly designed for exceptional strength with moderate corrosion resistance. The 17-4 PH stainless steel is composed of carbon, chromium, columbian + tantalum, copper, manganese, nickel, phosphorous, silicon, and sulfur. Now that’s a mouthful! YHM does not place an exterior can over the welded components of the body. This helps reduce costs, while providing a more rugged looking appearance. The YHM NITRO® 30 Stainless Suppressor kit comes with the welded suppressor body, (2) .30 caliber rear caps, (2) .30 caliber muzzle caps, (1) QD muzzle brake, (1) Basofil® heat resistant pouch, (2) assembly wrenches, and (1) carry case to hold all the parts. Below is a video showing one of the YHM employees talking about the NITRO 30 when it was still a prototype at the 2016 SHOT Show. .300 BLK: 8.0″ with QD muzzle brake; 16.0″ with QD flash hider. Why Do I Need or Want to Use a Suppressor? Anyone who has been around firearms for any amount of time knows just how loud, and sometimes painful, the report of a shot can be to the human ear. This is especially true for center-fired rifles. I know, I know, we’re always supposed to be wearing hearing protection, right? Well that’s great when we go to the range, and know we’re going to be participating in firearms training. At the same time, many SWAT Teams have integrated communication/hearing protection systems to insure their operators are protected and can still talk with each other. However, what about patrol officers, detectives, school resource officers, court officers, etc. that for the most part are required to enter their duties without any protection? 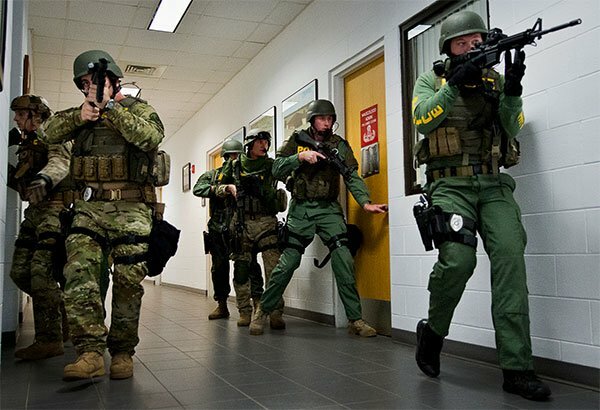 By now we should all know that over 90% of active shooter/mass killers are going to be confronted by patrol officers. These officers are being armed with patrol rifles (most often an AR-15), but how many agencies do you know who then provide realistic hearing protection for their officers? By realistic, I mean hearing protection that will stay in place during highly mobile and dynamic incidents, AND allow the user to maintain some form of face-to-face and radio communication. That’s what I thought – almost nobody is doing this. 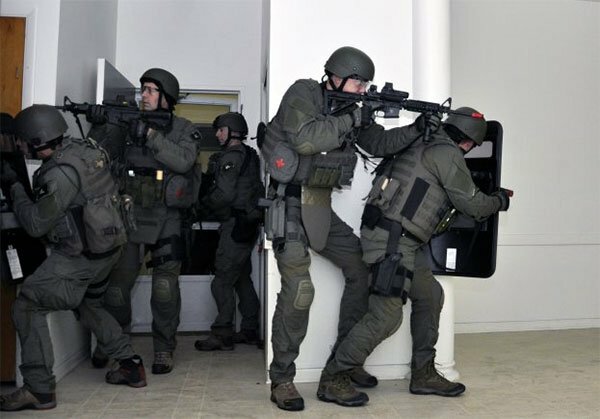 Even many SWAT teams (mine included) lack proper hearing protection and communications devices. How often do Patrol officers deploy with hearing protection? We know these shots can cause serious to permanent hearing loss (a work-related injury, think Workman’s Compensation), but we’ve failed to do anything about it. Well, the suppressor world is growing exponentially over the last few years, with no signs of stopping in the near future. With this growth, and expanded competition, the prices of suppressors have dramatically decreased. Add to that the potential of a Federal Hearing Protection Act to amend the National Firearms Act, and suppressor prices could drop in half, while supplies quadruple. With all these considerations in mind, a suppressor can be a truly advantageous purchase and rifle accessory. Now, instead of trying to buy expensive (and often dubious or fragile) communications systems to work with ballistic helmets, officers could field suppressed rifles that allow them to shoot safely with minimal or no other hearing protection. 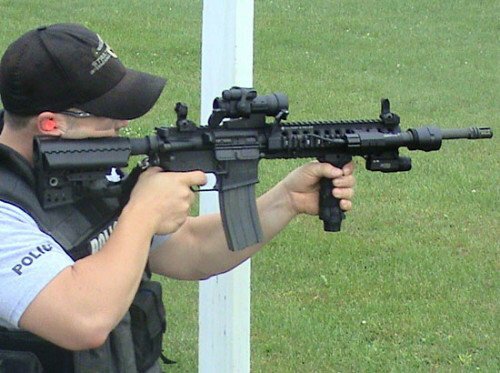 A suppressor would be extremely beneficial for both patrol officers, and SWAT Entry officers, that later often carrying extremely loud short-barreled rifles (SBR’s). 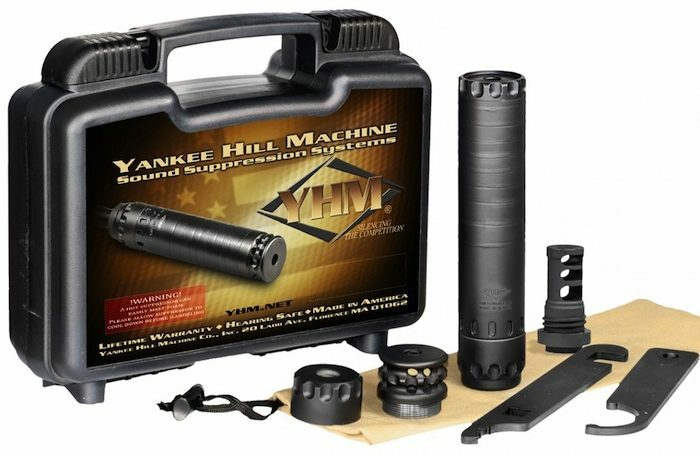 Yankee Hill Machine (YHM) is a highly regarded firearm components and accessory manufacturer. Their level of experience and expertise is evident in the end products they produce, and their creative design team is attentive to end-user and market demands. The NITRO® 30 Stainless Suppressor is an excellent example of YHM’s design and manufacturing capabilities. With a very wide range of rifle calibers capable of being suppressed, in combination with multiple mounting and muzzle cap options, the NITRO 30 is extremely user-friendly. Decibel reduction is solid, even for large-caliber rifles, and the price is very competitive.